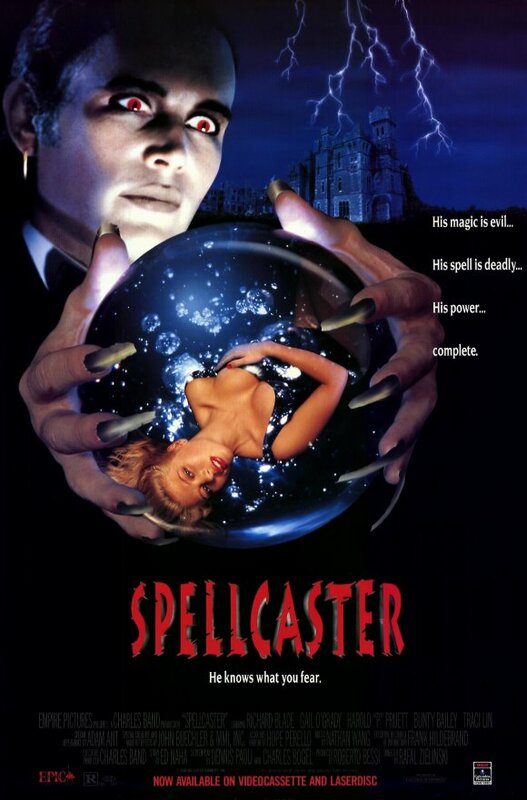 80s rock star Adam Ant plays the Devil, Diablo as he’s referred to in this flick, and he owns this castle in Italy. He’s also acquired this chick’s soul, Bunty Baily (Dolls) and given her wish to become rich and famous in the form of pop star, Cassandra Castle. Using her as bait, he has Cassandra arrange this contest for a bunch of people to win and come to Italy to search for a million dollar check in his castle. Of course this all a ploy for Daiblo, who’s secreted himself away in a hidden room, to acquire more souls, and he watches through his crystal ball waiting for the right opportunity to do something sinister to these people. The primary characters are brother and sister, Jackie (Gail O’Grady) and Tom (Harold Pruett), who are seeking a way out of their middle class lives. Other contestants are Yvette (Traci Lin), who gets devoured by a chair with a lion head and claws; Teri (Kim Ulrich), a blonde cocktease who gets accosted by a monstrous creature from a painting; Harlan (Michael Zorek), a glutton who gets turned into a pig; Tony (Marcello Modugno), an Italian con-man who finds the check, but gets lured up to the top of the castle and supernaturally tossed off to his death; and Myrna (Martha Demson), a snobby, upper-class English chick, whose demise completely escapes me at the moment. William Butler (Night Of The Living Dead 1990) and Mike Deak (the monster in Cellar Dweller) show up briefly as part of the crew filming the contest at the castle. On their way back after securing a HD camera they are randomly (i.e. supernaturally) blown up in their car. All the creature FX was done by John Buechler and the highlight of the movie. The ending though is very reminiscent of The Gate (1987), where most of the main cast has been killed off but come back to life once the Evil has been vanquished. In this case Cassandra makes a new deal with the devil to rescue everyone’s soul. A piece of the Resonator from From Beyond (1986) can be seen as set dressing in the final scene in Diablo’s lair. And there are a couple of odd scenes where a meowing cat can be heard. In the first scene I thought it was pre-mediated to get a character to creep down into a dungeon where she’s groped by a gang of zombies, but the other scene has a character battling a suit of armor, and you can clearly hear this cat meowing in the background, which in the context of the scene makes no sense at all. Either a cat was actually present, or you know most of those castles are known to be haunted, so it could also be a case of a “ghost cat,” where the meowing was only picked up by the audio equipment. Back on November 22nd MGM released it under their Limited Edition Collection (MOD)! Buy it here on Amazon! Video/Audio/Subtitles: 1.85:1 anamorphic widescreen—2.0 English Dolby Digital—No subtitles. The transfer looks pretty good! Certainly better than any full frame VHS. Extras included . . . NONE! I’ve always liked this flick, mostly because of its late 80s nostalgic vibe, and to see some stars who were in other more popular genre flicks. Lin did Fright Night, Part 2 (1988) around this time and Kim Ulrich will be recognizable to anyone who’s seen that “Cocoon” episode of Monsters (1988-1990). Gallery | This entry was posted in Spellcaster (1988) MGM MOD. Bookmark the permalink.